John Locke (August 29, 1632 – October 28, 1704) was a seventeenth-century English philosopher and social activist concerned primarily with governance, political theory, epistemology,and religious tolerance. His political writings provide a pivotal philosophical defense for modern democratic institutions. As a philosopher, he was an early proponent of Empiricism. Locke also made contributions in the fields of theology, education, and economics. Though Thomas Hobbes and especially Francis Bacon had pioneered the empirical method before him, John Locke is considered the first of the three major British Empiricists along with George Berkeley and David Hume. Locke is known for his rejection of the theory of innate ideas in favor of an emphasis on the role of sense perception, and for the expression “tabula rasa” that is associated with this position. Locke was an important political thinker, whose Second Treatise on Government is credited with influencing Thomas Jefferson's drafting of the Declaration of Independence. He also influenced other protagonists of the American Revolution including Benjamin Franklin and Alexander Hamilton. Locke's emphasis on the role of the individual and his questioning of the Divine role of the monarchy serve to this day as key underpinnings of modern democracy. Locke was a pious man. He defended a faith based on reason rather than scriptural authority. On the other hand, the moderately agnostic nature of his empiricism opened the way for others to question and challenge any possibility of reaching certainty in matters of faith. In that sense, his methods compare to those of the continental rationalist Descartes who, like Locke, defended Christian beliefs, but through methods that led some of his protegés to reject that faith, using the very tools (of reason in Descartes's case) that he had provided them. Locke played a key role in the emergence of Britain's "gentlemanly religion" that stressed reason over heart and looked scornfully at what it referred to as "religious enthusiasm." He saw uncontrolled religious emotions as contributing to costly Christian gaffes such as the unjust censoring of Galileo; hence he believed reason and observation should govern the Christian's life. Later critics of the religion of reason, however, sought a robust religion that could win the souls of sinners and inspire movements against injustice; to that end love and compassion, rather than reason, better serve as the defining Christian measures of truth and goodness. Locke is to be commended for his efforts to maintain objectivity in his philosophical and political inquiries and for his willingness to speak out against the political injustices of his days. John Locke was born in Wrington, Somerset, about ten miles from Bristol, England, in 1632. His father, a lawyer, served as a captain of cavalry for Parliament during the English Civil War. In 1647, Locke was sent to the prestigious Westminster School in London. After completing his studies there, he obtained admission to the college of Christ Church, Oxford. The dean of the college at the time was John Owen, vice-chancellor of the university and also a Puritan. Although he was a capable student, Locke was irritated by the undergraduate curriculum of the time. He found reading modern philosophers, such as Rene Descartes, more interesting than the classical material taught at the University. Locke was awarded a bachelor's degree in 1656 and a master's degree in 1658. Although he never became a medical doctor, Locke obtained a bachelor of medicine in 1674. He studied medicine extensively during his time at Oxford, working with such noted virtuosi as Robert Boyle, Thomas Willis, Robert Hooke and Richard Lower. In 1666, he met Anthony Ashley Cooper, First Earl of Shaftesbury, who had come to Oxford seeking treatment for a liver infection. Cooper was impressed with Locke and persuaded him to become part of his retinue. Locke had been looking for a career and in 1667 moved into Shaftesbury's home at Exeter House in London, ostensibly as the household physician. In London, Locke resumed his medical studies, under the tutelage of Thomas Sydenham. 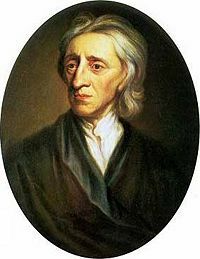 Sydenham had a major impact on Locke's natural philosophical thinking - an impact that resonated deeply in Locke's writing of An Essay Concerning Human Understanding. Locke's medical knowledge was soon put to the test, since Shaftesbury's liver infection became life threatening. Locke coordinated the advice of several physicians and was probably instrumental in persuading Shaftesbury to undergo an operation (then life-threatening itself) to remove the cyst. Shaftesbury survived and prospered, crediting Locke with saving his life. It was in Shaftesbury's household, during 1671, that the meeting took place, described in the Epistle to the reader of the Essay, which was the genesis of what would later become Essay. Two extant drafts still survive from this period. Shaftesbury, as a founder of the Whig movement, exerted great influence on Locke's political ideas. Locke became involved in politics when Shaftesbury became Lord Chancellor in 1672. Following Shaftesbury's fall from favor in 1675, Locke spent some time traveling across France. He returned to England in 1679 when Shaftesbury's political fortunes took a brief positive turn. It was around this time, most likely at Shaftesbury's prompting, that Locke composed the bulk of the Two Treatises of Government. Locke fled to the Netherlands in 1683, under strong suspicion of involvement in the Rye House Plot (though there is little evidence to suggest that he was directly involved in the scheme). In the Netherlands Locke had time to return to his writing, spending a great deal of time re-working the Essay and composing the Letter on Toleration. Locke did not return home until after the Glorious Revolution. The bulk of Locke's publishing took place after his arrival back in England—the Essay, the Two Treatises and the Letter on Toleration all appeared in quick succession upon his return from exile. He died in 1704 after a prolonged decline in health, and is buried in the churchyard of the village of High Laver, east of Harlow in Essex, where he had lived in the household of Sir Francis Masham since 1691. Locke never married or had any children. Events that happened during Locke's lifetime include the English Restoration, the Great Plague and the Great Fire of London. He did not quite see the Act of Union of 1707, though the office of King of England and King of Scotland had been held by the same person for some time. Constitutional monarchy and parliamentary democracy were in their infancy during Locke's time. Locke followed the lead of Descartes in moving away from the remnants of medieval scholasticism, but he rejected Descartes’ rationalism in favor of the empirical method. With Locke, the opposition between continental rationalism and British empiricism solidified, both currents of thought seeking to replace medieval consciousness in their own distinct way, based on the autonomy of the human mind. Locke’s epistemology, insisting on the role of experience, stands in direct relationship to his stand against abusive authority in questions of religious freedom and political governance. Locke’s thought system as a whole is not without inconsistencies. Unlike philosophers like Berkeley, Hume, or Kant, his aim was not to push one precise idea or method to its extreme conclusions. His principal aim was to account for reality by staying as close as possible to common sense, and he was always willing to admit that there were limits and flaws in his tentative explanations. In that sense, it can be said that his empiricism also contained a good dose of healthy pragmatism. The influences of Locke's Puritan upbringing and his Whig political affiliation expressed themselves in his published writings. Although widely regarded as an important influence on modern ideas of political liberty, Locke did not always express ideas that match those of the present day. Locke's first major published work was A Letter Concerning Toleration. Religious toleration within Great Britain was a subject of great interest for Locke; he wrote several subsequent essays in its defense prior to his death. Locke's upbringing among non-conformist Protestants made him sensitive to differing theological viewpoints. He recoiled, however, from what he saw as the divisive character of some non-conformist sects. Locke became a strong supporter of the Church of England. By adopting a latitudinarian theological stance, Locke believed, the national church could serve as an instrument for social harmony. Locke is best known for two works, An Essay Concerning Human Understanding and Two Treatises of Government. The Essay was commenced in 1671, and as Locke himself described, was written in fits and starts over the next 18 years. It was finally published in December 1689. Though the exact dates of the composition of the Two Treatises are a matter of dispute, it is clear that the bulk of the writing took place in the period from 1679-1682. It was therefore much more of a commentary on the exclusion crisis than it was a justification of the Glorious Revolution of 1688, though no one doubts that Locke substantively revised it to serve this latter purpose. Locke’s views on religious toleration involve the separation of Church and State, the State’s role being limited to guaranteeing that certain religious practices or attitudes do not disturb civil peace, choices of faith being left to the believers. Locke’s position involves skepticism about our capacity to recognize the ultimate truth of any doctrine. Locke originally published the Letter anonymously, in Latin, in Amsterdam, though it was almost immediately translated into English. He distinguishes a church from a civil government by the ends each pursues and by the means most appropriate to those ends. Government exists for the sake of peace, and must use force to achieve it; a church is a voluntary community for the salvation of souls, and must therefore use persuasion. Individuals cannot alienate control over their own souls, and so cannot make the government responsible for their salvation; force cannot bring about the changes necessary for salvation; and even if it could, there is no certainty that the religion doing the oppressing is the true religion. As a result, even were the government inclined to support a particular church, it could not do so without disturbing civil peace. Government may, however, regulate religion for political reasons (e.g., to forbid the public slaughter of all animals for health reasons, even if this prevents certain religious practices). Religious sects that refuse to accept Locke's doctrine of toleration of necessity seek a change in the government, and so may be suppressed as revolutionary. As there is no reason to keep promises without fear of God, and as civil peace requires that men keep their promises, the government may take an interest in promoting some form of religion. An Essay Concerning Human Understanding is Locke's most famous work. In it, Locke critiques the philosophy of innate ideas and builds a theory of the mind and knowledge that gives priority to the senses and experience. He describes the mind at birth as a blank slate (tabula rasa), filled later through experience. The essay was one of the principal sources of empiricism in modern philosophy, and influenced philosophers such as David Hume and Immanuel Kant. The way Locke states his purpose in the “Epistle” preceding the essay is strongly reminiscent of Kant’s own objective, or rather it is an anticipation of Kant’s undertaking in the first Critique. Locke speaks of the limits of human understanding and the danger of trying to go beyond our natural capacities, letting our thoughts “wander into those depths where they can find no sure footing,” with the consequence of ending up in “perfect skepticism,” which became in fact the position of Hume. What distinguishes Locke from Kant is the absence of the critical element—a factor meant to give a clear-cut criterion of legitimate knowledge based on the functions of our consciousness. Locke is an empiricist, in the sense that his starting point lies in the perception of sense objects, rather than in the function of our mind. Yet, even Locke admitted that our mind came with some ability to process the ideas that form the objects of our understanding. Locke drafted the Essay over a period of about 18 years. In the "Epistle to the Reader," Locke writes that the germ of the essay sprung from a conversation with friends. At a point where this discourse seemed stuck, Locke remarked that it could not proceed without a close examination of "our own abilities and...what objects our understandings were, or were not, fitted to deal with." This conversation occurred around 1671, and in that year Locke formulated two drafts of the Essay. He would continue to work on it for nearly two decades, clarifying and expanding his basic position. Though dated 1690, the book actually first appeared in 1689 (Encyclopedia of Philosophy, 489). Locke's main thesis is that the mind of a newborn is a blank slate and that all ideas are developed from experience. Book I of the Essay is devoted to an attack on the doctrine of innate ideas. Locke allowed that some ideas are in the mind from an early age, but argued that such ideas are furnished by the senses starting at birth: for instance, differences between colors or tastes. If we have a universal understanding of a concept like sweetness, it is not because this is an innate idea, but because we are all exposed to sweet tastes at an early age. Book II of the Essay sets out Locke's theory of ideas, including his distinction between passively acquired simple ideas, such as "red," "sweet," "round," etc., and actively built complex ideas, such as numbers, causes and effects, abstract ideas, ideas of substances, identity, and diversity. Locke also distinguishes between the truly existing primary qualities of bodies, like shape, motion and the arrangement of minute particles, and the “secondary qualities” that are "powers to produce various sensations in us" (Essay, II. viii.10) such as "red" and "sweet." These “secondary qualities,” Locke claims, are dependent on the “primary qualities.” This part of Locke’s thought would be sharply and famously criticized by Berkeley, who argued that there was no basis for a distinction between primary and secondary qualities and for asserting that primary qualities were any more “real” than the secondary ones. The weak point in Locke’s thought is that, in his own words, the substrate of those primary qualities, substance, is a “I know not what.” In other words, Locke is convinced that there must be something (substance) that is the foundation of objective existence and carries the primary qualities, but he is unable to further define it based on his empirical method. Along these lines, Locke also argued that people have no innate principles. Locke contended that innate principles would rely upon innate ideas, which do not exist. For instance, we cannot have an innate sense that God should be worshipped, when we cannot even agree on a conception of God or whether God exists at all (Essay, I.iii). Here, the close relationship between Locke’s epistemology and his moral and social views becomes evident. One of Locke's fundamental arguments against innate ideas is the very fact that there are no truths to which all people attest. He takes the time to argue against a number of propositions that rationalists offer as universally accepted truths, for instance the principle of identity, pointing out that at the very least children and idiots are often unaware of these propositions. Whereas Book I is intended to reject the doctrine of innate ideas proposed by Descartes and the rationalists, Book II explains that every idea is derived from experience either by sensation–direct sensory information–or reflection–mental construction. In chapter 27 of Book II, Locke discusses personal identity, and the idea of a person. What he says here has shaped our thoughts and provoked debate ever since. Book III is concerned with language, and Book IV with knowledge, including intuition, mathematics, moral philosophy, natural philosophy ("science"), faith, and opinion. The close of Book II suggests that Locke discovered a close relationship between words and ideas that prompted him to include a book on language before moving on to discuss knowledge. Book III addresses definitions, names, and the imperfections and abuses of verbal communication. To most scholars, this content is less coherent and important than the surrounding material (Encyclopedia of Philosophy, 496). Book IV is devoted to a discussion of knowledge, including intuition, mathematics, moral philosophy, natural philosophy ("science"), faith and opinion. Just as it was critical of Cartesian rationalism, Locke's empiricist viewpoint was in turn sharply criticized by rationalists, namely in the person of Gottfried Leibniz. In 1704, Leibniz wrote a rationalist response to Locke's work in the form of a chapter-by-chapter rebuttal, the Nouveaux essais sur l'entendement humain ("New Essays on Human Understanding"). At the same time, Locke's work provided crucial groundwork for the work of future empiricists like David Hume. Published as one book, the two treatises are unequal in size and in influence. In the First Treatise Locke attacks Sir Robert Filmer who had defended a peculiar theory of the Divine Right of Kings. Rather strangely, Filmer derived the absolute right of kings from the royal authority endowed by God to Adam. In a point-by-point biblical refutation, complete with Hebrew quotations, Locke easily ridicules Filmer’s position and his conclusion that the British king of his time had received a special privilege to rule over other men because he descended from Adam. Locke’s refutation is humorous and entertaining, but in the process he makes important statements on marriage and family life. His main point is to stress the limitations of paternal authority. Essentially, men and women are born equal and free and the parental function is to care for children while they are still immature. While recognizing the need for marriage and the family, Locke thus introduces a rather minimalist view of these institutions, coupled with a stress on individual freedom and responsibility. The Second Treatise, or True End of Civil Government, is one of Locke’s two most influential works. It purports to justify the Glorious Revolution by developing a theory of legitimate government and arguing that the people may remove a regime that violates that theory; Locke leaves it to his readers to understand that James II of England had done so. He is therefore best known as the popularizer of natural rights and the right of revolution. Locke posits a state of nature as the proper starting point for examining politics, which is consistent with his view that our origin in a common ancestor, Adam, is of little significance. Individuals have rights, but also duties, which are defined in terms of protecting their own rights and respecting those of others. Through the law of nature, which Locke describes as "reason," we are able to understand why we must respect the natural rights of others (including the right to property for which one has labored). In practice, the law of nature can be ignored—and thus, government is necessary. However, unlike Hobbes, Locke does not see the natural condition as a permanent state of war of all against all, but rather a situation where the Golden Rule of reciprocity is generally followed. Civil government can be created only by the consent of the governed, leading to a commonwealth of laws. As law is sometimes incapable of providing for the safety and increase of society, man may acquiesce in being done certain extralegal benefits (prerogative). All government is therefore a fiduciary trust: when that trust is betrayed, government dissolves. A government betrays its trust when the laws are violated or when the trust of prerogative is abused. Once government is dissolved, the people are free to erect a new one and to oppose those who claim authority under the old one, that is, to revolt. Locke proposed a labor theory of property that built on the idea of natural law (see Thomas Aquinas). By mixing an object with his labor, man then owns that object. However, labor also set the bounds of private property because, under the labor idea, a person could only own that which could be enjoyed and used. By these bounds, the economy should run efficiently because property will not be wasted, spoiled, or hoarded. Scholars believe that Karl Marx later adapted Locke's theory on property in his philosophies. In his later years, Locke published the Reasonableness of Christianity (1695) and, even later, Paraphrases and Notes on the Pauline Epistles (published posthumously, 1705-1707). Though Locke is certainly not remembered as a biblical scholar, he already displayed his considerable erudition in earlier works, such as the First Treatise on Government. Locke’s position was that a reasonable Christian faith and morality could be derived naturally from Scripture based on the simple principles found in it. He also pioneered biblical criticism by trying to reconstruct the original teachings of Jesus and, in particular, paid attention to the issue of the “messianic secret” (i.e., the reason why Jesus did not reveal his identity openly). Generally, Locke exercised a profound influence on subsequent philosophy and politics. He influenced the continental Enlightenment, notably in France, through thinkers like Montesqieu and Voltaire. Upon his return from exile in London, the latter popularized Locke’s ideas on freedom and independence of mind mixed with moderate skepticism in matters of theoretical inquiry. Compared to the French philosophes, however, Locke was remarkably moderate, and there was no anti-religious element in his thought. Most importantly perhaps, Locke's notions of a "government with the consent of the governed" and people's natural rights—life, liberty, health and property—had an enormous influence on the development of political philosophy. Locke’s ideas on liberty and the social contract influenced the written works of Thomas Jefferson, James Madison, and other Founding Fathers of the United States. His ideas helped form the basis for the concepts used in American law and government, allowing the colonists to justify revolution. In particular, the Declaration of Independence drew upon many eighteenth century political ideas derived from the works of Locke. Appraisals of Locke have therefore been tied to appraisals of the United States and of liberalism in general. Detractors note that he was a major investor in the English slave-trade, as well as his participation in drafting the Fundamental Constitution of the Carolinas while Shaftesbury's secretary, which established a feudal aristocracy and gave a master absolute power over his slaves. Most scholars reject these criticisms, however, questioning the extent of his impact upon the Fundamental Constititution and his detractors' interpretations of his work in general. Locke's epistemology and philosophy of mind also had a great deal of significant influence well into the Enlightenment period and beyond. "Stop Traveller! Near this place lieth John Locke. If you ask what kind of a man he was, he answers that he lived content with his own small fortune. Bred a scholar, he made his learning subservient only to the cause of truth. This thou will learn from his writings, which will show thee everything else concerning him, with greater truth, than the suspected praises of an epitaph. His virtues, indeed, if he had any, were too little for him to propose as matter of praise to himself, or as an example to thee. Let his vices be buried together. As to an example of manners, if you seek that, you have it in the Gospels; of vices, to wish you have one nowhere; if mortality, certainly, (and may it profit thee), thou hast one here and everywhere." Hall, Roland (ed.). Locke Studies an annual journal of research on John Locke (by subscription). Retrieved August 30, 2008. This page was last modified on 18 May 2018, at 19:58.